The front collision sensor circuit (front airbag sensor RH circuit and front airbag sensor LH circuit) is composed of the center airbag sensor assembly, front airbag sensor RH and front airbag sensor LH. The front airbag sensor RH or front airbag sensor LH detect impacts to the vehicle and send signals to the center airbag sensor assembly to determine if the airbag should be deployed. 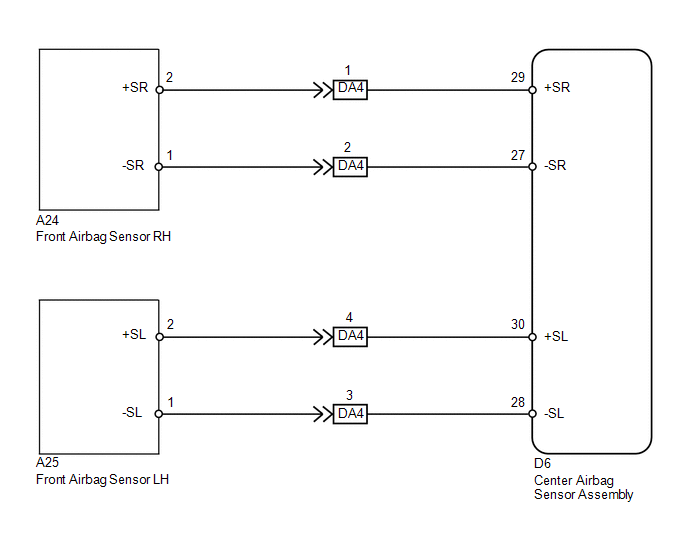 DTC B161A/8A is stored when a malfunction is detected in the front collision sensor circuit (front airbag sensor RH circuit and front airbag sensor LH circuit). The center airbag sensor assembly receives a line short circuit signal, an open circuit signal, a short circuit to ground signal or a short circuit to B+ signal in the front collision sensor circuit (front airbag sensor RH circuit and front airbag sensor LH circuit). If a communication error occurs, DTCs for both LH and RH sides will be stored simultaneously. To identify the malfunctioning area, turn the ignition switch off and then to ON again. (d) Check for DTCs (See page ). DTCs B1613/83 and B1618/84 are not output. Codes other than DTCs B1613/83 and B1618/84 may be output at this time, but they are not related to this check. (b) Clear the DTCs stored in memory (See page ). (e) Check for DTCs (See page ). DTC B161A/8A is not output. Codes other than DTC B161A/8A may be output at this time, but they are not related to this check.